Today I'm especially pleased to feature a guest TeachingAuthor interview with my good friend, Karen Halvorsen Schreck, whose second young-adult novel, While He Was Away (Sourcebooks Fire) was just released YESTERDAY! After reading the interview, I hope you'll enter for a chance to win an autographed copy of Karen's book. And don't forget to also enter our Blogiversary giveaway contest to win one of THREE $30 gift cards from Biblio.com, where you can purchase new and used books from independent booksellers around the world, often with free shipping. The winner of a Pushcart Prize and an Illinois State Arts Council Grant, Karen Halvorsen Schreck has a doctorate in Creative Writing. Her first young-adult novel, Dream Journal (Hyperion), was a 2007 Young Adult BookSense Pick. 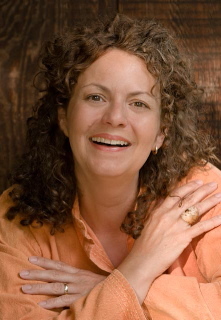 She is also the author of the acclaimed picture book, Lucy's Family Tree (Tilbury). Karen balances her writing and freelance work with teaching writing and literature at the college level. She also loves to do author visits! For information about her, visit her website or the official While He Was Away website. Karen, how did you become a TeachingAuthor? My parents were teachers, and from the time I was a very little girl, and talked C.S. Lewis’ The Lion, The Witch, and the Wardrobe with a college English professor who actually chummed around with Lewis and the other Inklings in Oxford, I knew that I wanted nothing more in my life than to read, write, and share books. I was blessed with a wonderful high school English teacher who fearlessly taught authors like Flannery O’Conner, D. H. Lawrence, and Leo Tolstoy (among so many others). In college I discovered how healing and meaningful the writing process was for me by taking a creative writing class. I taught my first college class when I was a twenty-three-year-old Creative Writing graduate student, and I’ve taught many, many since. I find I learn about writing from teaching about writing—my students and the published authors we’ve studied together have always taught me so much. Like writing, teaching is really so much about finding the right voice to tell the right story to a particular audience—the two go hand-in-hand, as craft and art. I feel alive and engaged when I teach. I feel alive and engaged when I write. What's a common problem/question that your writing students have and how do you address it? Many people of all ages (myself included) seem to experience a kind of inner critic—a censoring voice that’s been internalized that expresses itself in various ways: either when faced with a blank page (Oh! I have no ideas! I am not good enough! I have nothing to say!) or after the first burst of inspired writing (Well, that might have been good, but where do I go from here? ), or at the end of a first draft (What c&*p—this’ll never see the light of day. I’m putting it in a drawer/recycling it/using it as kindling). I’ve seen students find great relief when they externalize that voice as words on paper, perhaps tracing the origins of the voice to an actual person or people in their lives, or creating a character who represents the voice. Sometimes I’ll ask them to draft a character description of the critic. I always ask them to write out the statements, almost in a kind of exorcism (if I may use this term). I encourage them to ritualize this process. Maybe writing it is enough, but some have shredded their critical words, and then proceeded to write from there. If that’s not sufficient, I have them describe or create someone who’s profoundly affirming, and then write down what they might say to encourage the writing process. People honestly have been freed up by doing this exercise, and they’ve come back to it again and again. I love the idea of "exorcising" our inner critic! I'm going to have to give it a try. Would you also share a writing exercise for our readers? I love having students create what I call a Body Map. Through drawing or collage or sculpture or sewing—you name it, people have done it—they’ll represent visually the stories, memories, images, their bodies carry—the blessings and burdens they’ve born over their histories. It’s a fun and profound exercise to do over a period of time. The results are often quite beautiful and meaningful, and people discover that in their own physical experience, they have no shortage of story material. Wow, what a tactile way of coming up with story ideas Thanks, Karen. Now, can you tell us a bit about your new book, While He Was Away, and how you came to write it? 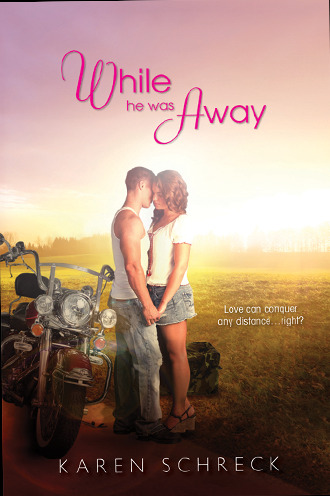 My YA novel, While He Was Away (Sourcebooks Fire), is about an eighteen-year old girl, Penna Weaver, whose boyfriend, David O’Dell, is deployed to Iraq. Penna and David are deeply in love, and commit to be true to each other while he’s away, but Penna quickly realizes that the realities of David’s situation will make this more challenging than either of them expected. Lonely and isolated, it seems Penna’s world is falling apart, until she works to solve a family mystery, hidden for half a century, about love in wartime, and ultimately learns some powerful truths about love and forgiveness. The inspiration for this novel lay in my own family history, and in my own response to the news I was hearing about young soldiers deployed to Iraq. My father served in WWII; my mother’s first husband was killed in WWII. I grew up hearing war stories, and when this current generation of young people put their lives on the line, I was struck by a certain disconnect between what they seemed to be experiencing, and how our nation was responding, and the experience of my parents’ generation. When I don’t understand something, I find it helpful to explore the questions through story-telling. I may never get black and white answers (good fiction rarely give these), but I do experience a sense of resolution. I hope someone else reading While He Was Away does too. Karen, do you have any suggestions for teachers on how they might use one of your books in the classroom? I could give suggestions for all three of my books, but I’ll focus on While He Was Away. :-) I think this novel could give teachers the perfect opportunity to encourage their students to consider the ways in which their personal, family histories intersect with their shared, communal history. My process in writing the novel really parallels my character Penna’s process over the course of the novel. We both asked: what don’t we understand about our pasts, what mysteries are there, and how do these mysteries from the past connect with the pressures all around us, the lives we are living now, the events of this world? Or to put it another way: what family stories do you need explore and tell in your own way? Finally, would you tell us how you first became interested in writing? When I was in third grade, I became obsessed, as many girls do (or at least did, at that time), with the book Harriet the Spy. As you may know, the book’s central character, Harriet, records her observations about the world in an orange notebook. Well, I went out and bought an orange notebook. I proceeded to do the same as Harriet, carrying that notebook everywhere I went, documenting my life to the best of my ability, and even writing a few chapters of my first attempt at a novel (no surprise: the novel involved a girl and a horse called . . . Starfire; I was also on a big Margeurite Henry kick). I still have that notebook to this day, and I still carry a notebook in my purse, just in case I need to jot something down. There is something really wonderful about having the perfect notebook . . . and pen . . . and pencil . . . just in case. Thanks so much, Karen, for sharing with us today. Readers, I'm especially thrilled to celebrate the release of Karen's new book with you because I had the privilege of reading an early draft of the manuscript. I can't wait to get my hands on the final book. 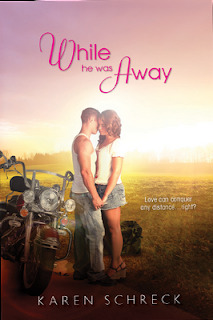 And you, too, can soon be holding your own autographed copy of While He Was Away by entering our giveaway contest. Before entering, please read our Book Giveaway Guidelines. Then answer the following question: If you're our winner, would you keep the book for yourself or pass it along to a young adult reader, and if so, to whom? You may either post your answer as a comment below or email your answer to teachingauthors [at] gmail [dot] com with "Book Giveaway" in the subject line. If you enter via a comment, you MUST include a valid email address (formatted like: teachingauthors [at] gmail [dot] com) or a link to an email address where we can reach you. Your entry must be posted or received by 11 p.m. Monday, May 14, 2012 (Central Standard Time). The winner will be chosen in a random drawing and announced on May 16, 2012. Good luck, everyone! When you're done here, be sure to hop on over to April's post about our Third Blogiversary giveaway contest and enter to win one of THREE $30 gift cards from Biblio.com, which you can use to purchase new or used books from independent booksellers around the world, often with free shipping. Hi Carmela, this was a good interview about both writing and the new book. My father was killed in WWII & I too have been interested in those who are experiencing this terrible time, but not in anyone's news really, as in the time of WWII, unless one knows someone personally who has been deployed. If I was lucky enough to win the book, I certainly would pass it on to some student at my school. At the school students study individual topics, & there are always a few who choose to study some aspect of war, whether it is 'why' or a particular time in history. Thanks for the opportunity! It looks like a good story. Great interview, Carmela and Karen. Love the idea of exorcising that internal critic. And the idea of drawing a body map. So many memories are stored at a cellular level -- what a wonderful way to get at them. And I am so excited to read this book, which sounds like it will make visceral the hidden pain of so many of our country men and women who are bearing the burdens of a war the rest of us barely register on our radar. Another wonderful interview, Carmela. And Karen, just the nature and content of what you've shared makes me want to run out and begin reading WHILE HE WAS AWAY. Great interview! I'd read it first and then give it to one of my son's friends. I'm not sure who -- probably the girl whose mother is a soldier. I would read this book myself, share it with my teen daughter and then probably donate it to her school library. It's so wonderful to read your responses, Linda, Ellen, Care, and SueBE. This is really my first exchange on a blog since While He Was Away was officially released (yesterday). So thank you for your generous words. I'm happy that you feel interested in reading the story. Today, I was at IRA, and as I signed the book, I asked everyone who read--or who had students who would read--to please email their thoughts and questions. I am hoping that I will hear from people who have family or friends who are, or who have been, deployed, so SueBE, if you share with your son's friend, and she cares to email me, please encourage her to do so. "Like writing, teaching is really so much about finding the right voice to tell the right story to a particular audience—the two go hand-in-hand, as craft and art." Thanks, everyone, for the lovely feedback. And good luck to those entering for a chance to win Karen's book.